Solo concert at Trans Pecos, Queens, NY, usa 2015, filmed by Unartig. Hundreds of photos from concerts and recording sessions 2009-2015 from my flickr album “Platforms”. Click on the arrows in the edges to see more pictures, and in the middle of the picture to open the album in a separate window. 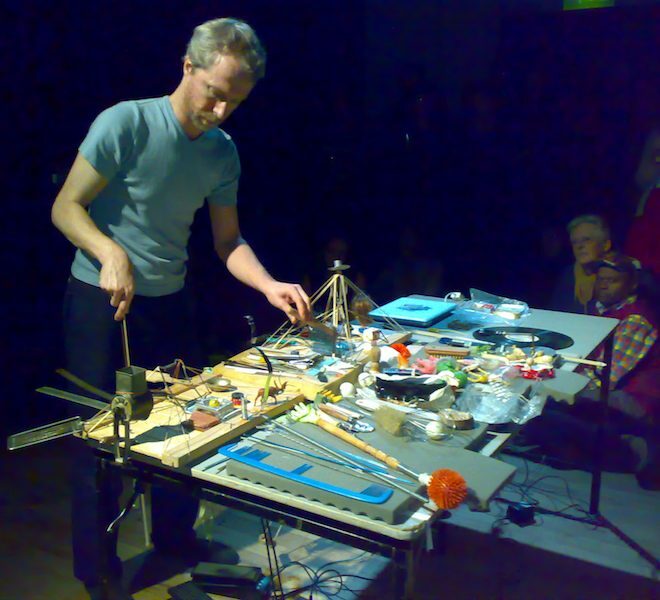 A solo concert at Audio Art Festival, Galeria Sztuki Współczesnej Bunkier Sztuki in Kraków 2014. I have seldom received such feedback from audience and colleagues. It was an extremely attentive, condensed atmosphere, in spite of many different, and great, performances before me. The concert was broadcasted live and the recording can be seen above. Photos © by Mikołaj Zając are published here, here and here. 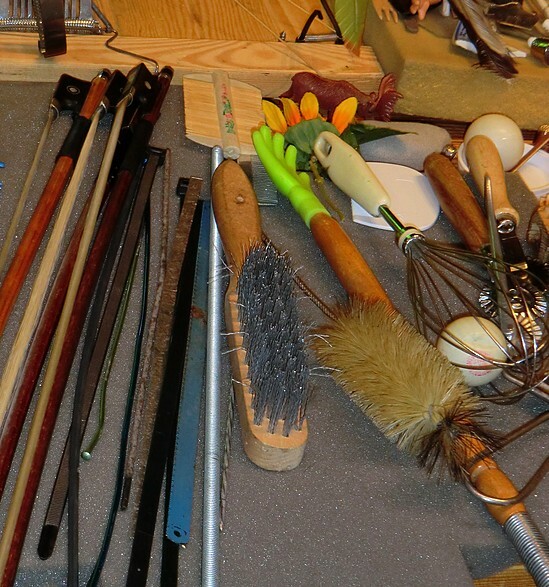 The history of an evolutionary meta-instrument in pictures and sound. Reverse chronological order. Introduction. 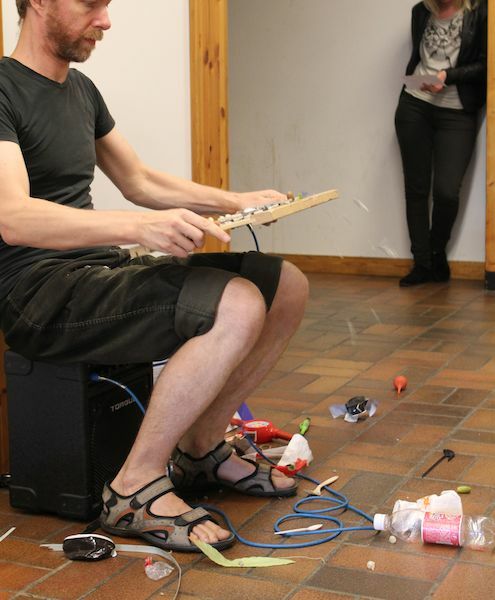 1) to develop the way of playing that emerged after many years of having the Whalefish as major instrument. 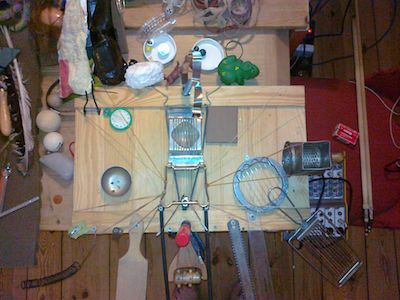 From having been thought out as an instrument, increasingly it became the platform for objects that its sound board amplifies. To make an instrument that has this as its main function then seemed necessary. 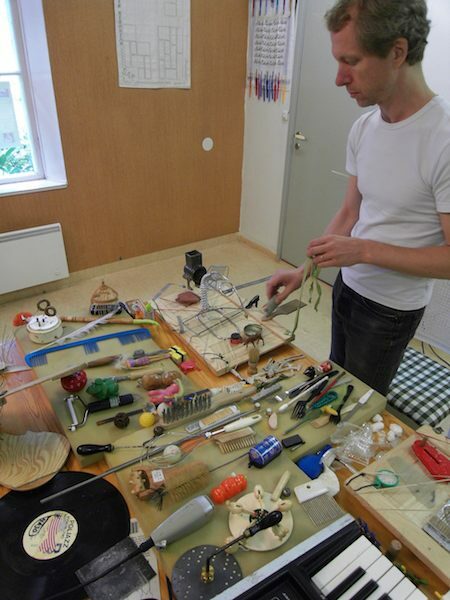 4) to be able to connect separate sources of amplified object sounds to electronic treatment, especially Micro Modulars. 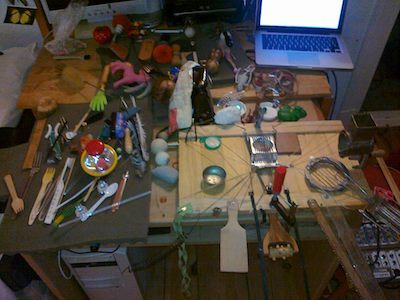 This last part is still to be developed, however when I play with other electronic musicians, the combination of amplified objects and electronics that I like works very satisfyingly. 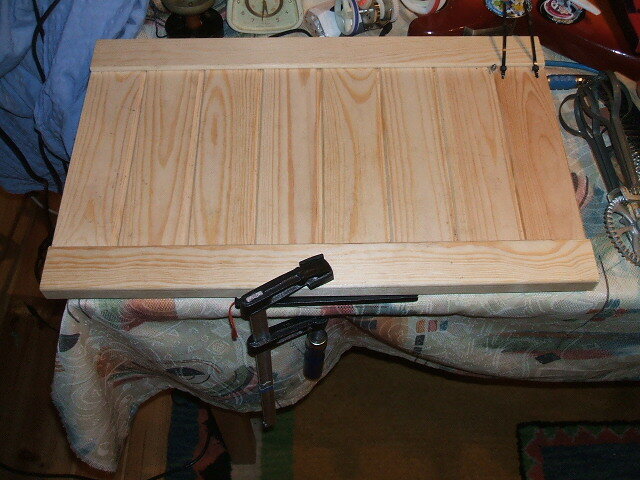 The materials for the soundboards of the Platforms are small doors for cupboards, found at a big store for building materials. 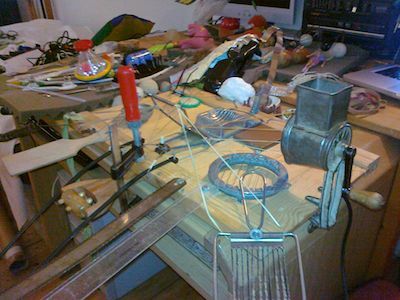 To keep them free to vibrate and at the same time stable for acoustic reflection and playing with stability, they're clamped to the table with something between the table and the instruments to keep them slightly above the table surface. An intermediate version between the Whalefish and the Platforms is the Stranded Whale, left unfinished and only used in one concert. 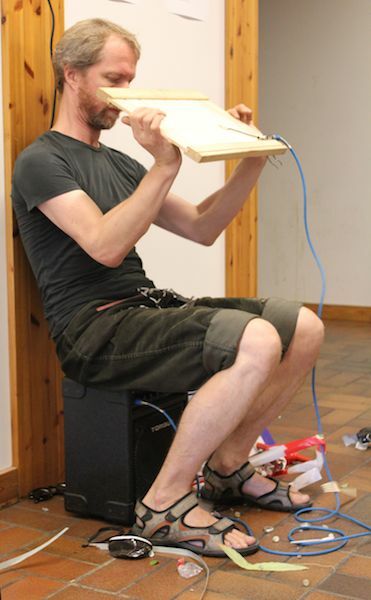 1) The Platforms first seemed to be a hybrid between instrument and an extended contact microphone, able to become a new instrument every time I use it, with attaching objects through screws and rubber bands (which are also used as sound sources of course). 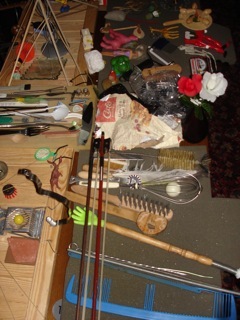 But I realized that for me as a musician, it was necessary to have a certain level of conservatism of speed and structure during the development in order to balance between control and safety on one hand, and surprise and chance on the other, so the two Platforms I was using actually became two specific instruments with a slow evolutionary development from concert to concert. You can track some of the changes in the pictures on this page. 2) On my trip to southeast Asia 2012, which combined my work as a piano technician (on a cruise) with the one as a musician (in Kuala Lumpur and Singapore), I had to limit my luggage and decided to bring only one Platform along. It turned out to work perfectly well. Later, I started visiting Berlin so often that I decided to park one Platform in Stockholm and one in Berlin, to make the travels lighter and cheaper (not having to pay for checked-in luggage). 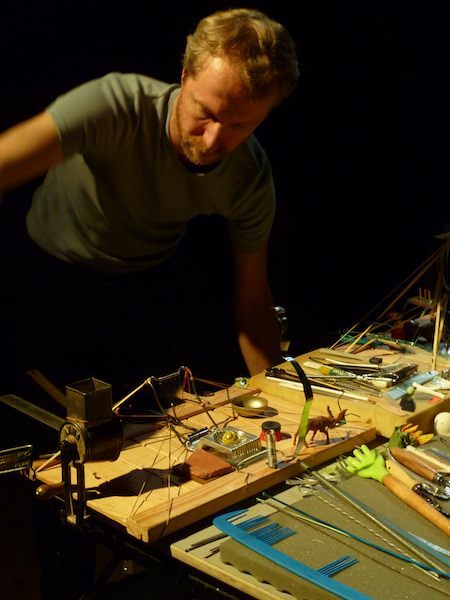 3) I almost never actually played the Platform with others, except in a few instances when I have shared it with other musicians: Kristian Bredin and David Bremer. The two extra Platforms haven't been used yet, they are still waiting. 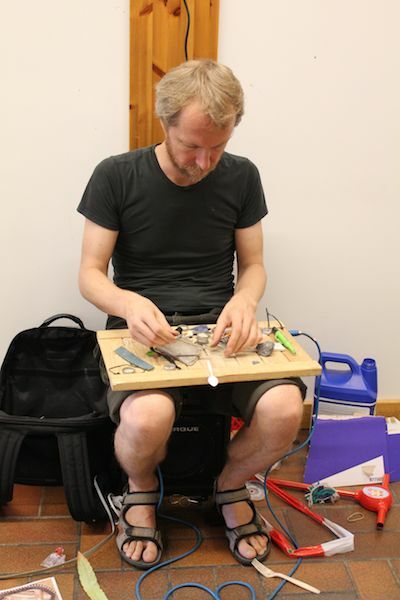 4) I skipped the idea of plugging in the sounds of amplified objects into electronics – I only made one piece with that idea: using a drone from the Micro Moog, see Beware of Aesthetic Ethics below. I realized that the sounds of amplified objects are so rich and varied that they are perfectly fine as they are. I like to combine them with electronics (and voice, and classical acoustic instruments), however, but since there are so many good musicians specializing in electronics more than I am, it's more interesting to play together with them than doing it myself, although I still like to use the Micro Moog very much. 5) It has often been a problem for me to call myself a “musician” with complete honesty. One is the economic and professional implications of that term, another is the limitation of expressive forms. 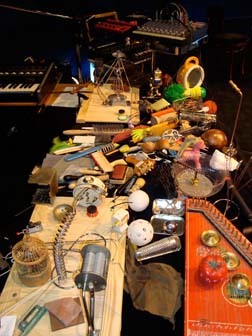 The work with the Platforms has emphasized this more clearly, and in 2012 I started applying the term “Surrealist Musical Object Theatre” as the most correct descriptive term for it. Musical object theatre, feat. 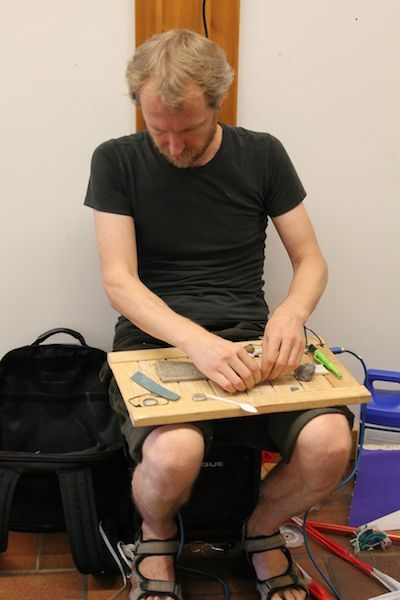 Johannes Bergmark from piak. 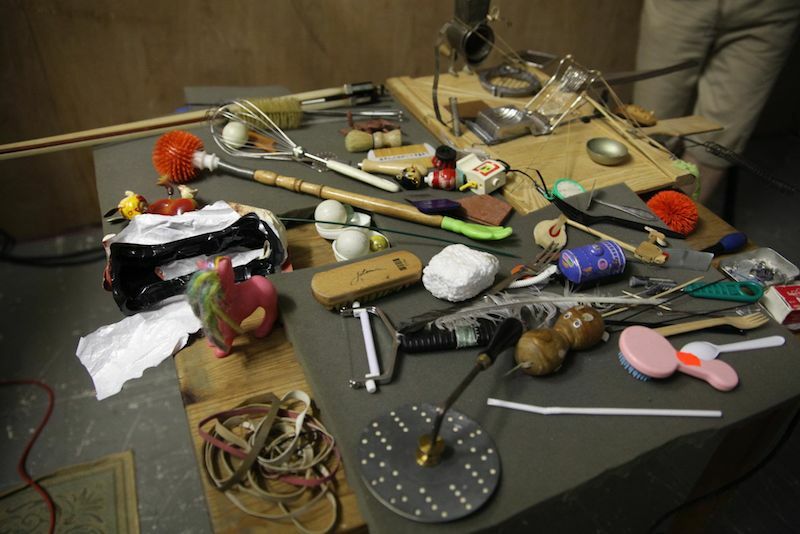 Music, object menagerie & action by Johannes Bergmark. Visual concept, video capture, editing & production by piak, 2013. Recorded at Fylkingen, Stockholm, July 31st, 2012. 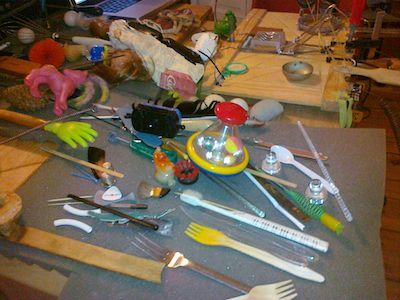 I find that the hidden sound potentials of discarded objects, toys and tools, found materials and weird flea market finds are just as fascinating as the surprising visual (and for me, tactile) appearance they have when they end up on the same little stage. In lucky cases it can be a poetic effect on many levels. However, in concerts (and in many concert documentations) it can be difficult for the audience to get the visual aspect very much, so I asked my friend piak, since I admire the high quality of his film work, to make a special little film with me focusing on the details. To my delight he accepted. piak's curious eye wanders its own way and it's wonderful to see that the music becomes at times a soundtrack to the other drama of the viewer. So l o   o n   m i n i m a l   t r a v e l   s e t   v e r s i o n   o f   t h e   P l a t f o r m s  a t   S t r a i t s   R e c o r d s ,   S i n g a p o r e, April   2 0 1 2 . Interviewed in Kuala Lumpur after a concert at Findars, organized by Herbal International, Kuala Lumpur, malaysia, April, 2012, with excerpts from the concert. 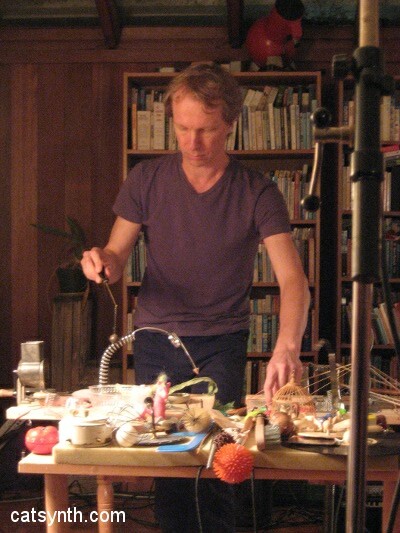 A concert in February, 2012 at Musikgemaket på Slottet, Halmstad, the INES series, + Live streaming, solo and short talk (swedish). 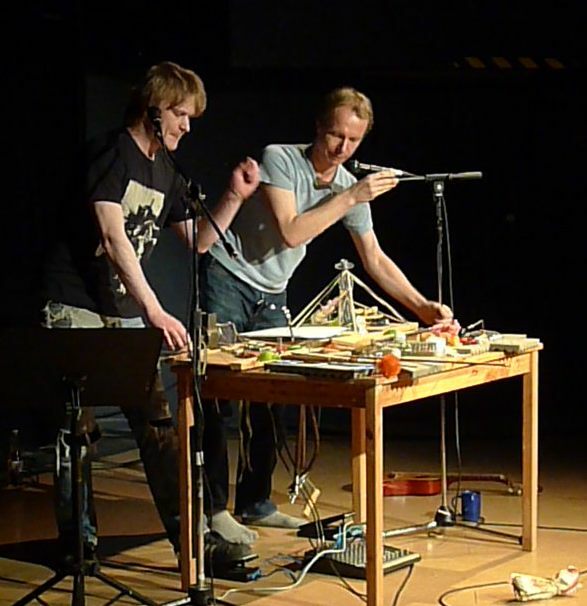 From RÖSTA PÅ FYLKINGEN - liten festival kring rösten (small voice festival) at Fylkingen, November, 2011, one of the very few cases where I have shared the Platforms, in this case together with David Bremer. Photo © by Girilal Baars and Per Åhlund. 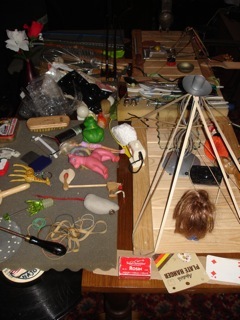 From a concert at The Royal Park, Leeds, arranged by the Leeds Surrealist Group, November 2011. Photos © by Kenneth Cox. 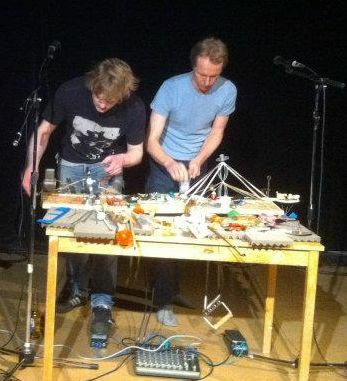 A live recording October 2011. From a concert at Fylkingen, October 2011. Concert review and photos © by Jonas Persson. For this cd, released 2010, I was invited to contribute with a one minute piece. 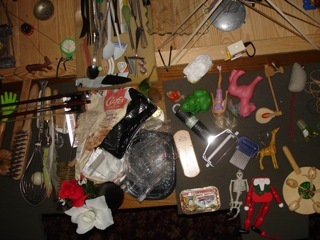 I recorded it at EMS and play a Platform (a single one) with objects. I made lots of versions to choose from. This is one that didn't get onto the cd. No overdubs, no cuts, no treatments except slight compression. In this downloadable/streamable celebration album of suRRism Phonoethics: Peak the Source - 'Volume 1-3' / sPE_0100, I have this piece called Beware of Aesthetic Ethics with a Micro Moog drone which is influenced by sounds from my Platforms of amplified objects, recorded at SAMI studio in Stockholm December 2009. No editing. At Grönt Ljud i Hågelbyparken (Ny Musik Stockholm) August 2009. 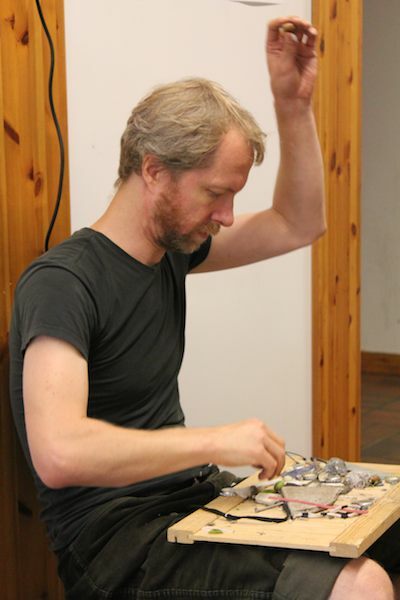 Playing the Brillolin at this moment, and the Finger Violin, Micro Moog and saws in the picture. First time I shared the Platforms with a colleague: Kristian Bredin, at the Networking Camp concert on Norberg Festival. Concert at Tom Duff's, Oakland 2009. Original source here. 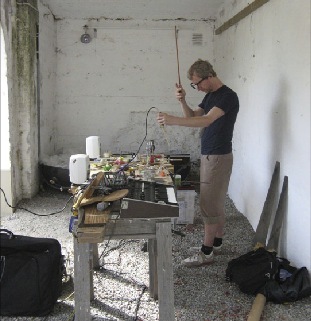 Excerpt from a concert in Apart Festival by Platform4 in Aalborg, denmark 2008. The basis of the Platform around October 2008, “naked”.